SSE SAM Sealed Area Map is a prototype service designed to produce mapping of sealed areas thanks data acquired by SPOT 4/5 and IRS LISS. What does Soil Sealing mean? Soil is sealed when agricultural or other rural land is taken into the built environment (land consumption) and is also a continuing process within existing urban areas, especially where urban population and the density of built structures is increasing and residual inner-city green zones are reduced.Soil sealing occurs as a result of the development of housing, industry, transport and other physical infrastructure, including utilities (e.g. waste disposal and water distribution) and military installations, i.e. as a result of the wider process of land consumption. Both processes – soil sealing and land consumption – are closely interrelated, usually occur in parallel, and denote different degrees of intensity of human soil consumption. In both cases, natural, semi-natural and rural land is turned to urban and other artificial land covers, which causes adverse effects on, or loss of, soil functions. Soil loss due to land consumption and sealing causes many pressures on soil ecosystems as well as other environmental impacts. It affects the climate at micro- and meso-scales by altering albedo, evaporation and local air temperatures. Using SPOT 4/5 and IRS LISS data, Planetek Italia has provided a service for sealed area extraction (including buildings, roads and infrastructure) over several European Countries: Italy, Malta, Cyprus, Albania, Greece, West Turkey and Macedonia. Mapping of up-to-date spreading of artificial structures is a basic pre-condition for planning and managing sustainable development of urban agglomerations and is a useful tool to check the soil performs the correct functions such as food and fibre production or the ecological ones. The sealed area maps are composed of two classes only: sealed and not sealed areas, where the sealed class embrace all artificial classes listed in CORINE legend except Green Urban areas. At the beginning the service was integrated under the framework of the MASS-SER-O2 project developed for the Ground Segment Department at ESA-ESRIN. Actually the service provided by Soil Sealing is integrated into the Service Support Environment SSE ESA (the former MASS- Multiple Application Support Service System-).The SSE portal, is part of the eoPortal web site, which provides links to many information sources by allowing the integration of wide range of heterogeneous EO and GIS services including catalogues of products. 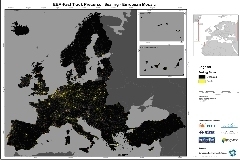 The service allows the user to search and select one or more Sealed Area maps from the ESA catalogue and then to download them via an FTP site. Users involved in urban monitoring and land management can take benefits using such a service. Typical users are Municipalities, Regional and Provincial Government, Public and Private Entities.